It's not the Trauma, It's the Drama by Marjorie Leigh Bomben – Now a paramedic field chief, Bomben looks back on thirty years of service in It's Not the Trauma, It's the Drama. For more than thirty years, Marjorie Leigh Bomben has been a member of the Chicago Fire Department, starting her career as a candidate paramedic working on an ambulance in some of the city’s toughest neighborhoods. Now a paramedic field chief, Bomben looks back on thirty years of service in It’s Not the Trauma, It’s the Drama. The twenty true stories Bomben relates are unique—all told from the point of view of a woman rising through traditionally male ranks. —Steve Chikerotis, Technical and storyline advisor for Chicago Fire the TV series and retired CFD deputy district chief. Bomben’s tales range from funny to gory, from the dangers paramedics face to the history of a venerable old firehouse. Some, of course, are about saving lives. Others are about simply staying alive. From Bomben’s first trauma call—the result of a drag race along city streets gone horribly wrong—to her eventual rise through the ranks, her tales shift seamlessly from humorous encounters to descriptions of injuries human beings shouldn’t be able to endure. 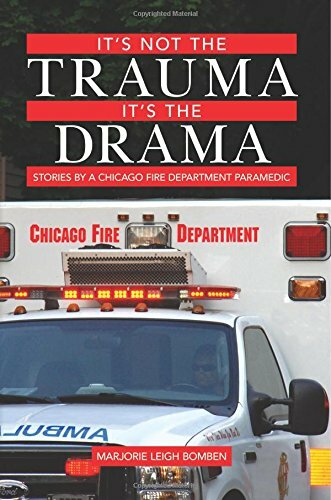 Through it all, It’s Not the Trauma, It’s the Drama offers a glimpse of the strain and risk experienced by Chicago Fire Department paramedics every day. 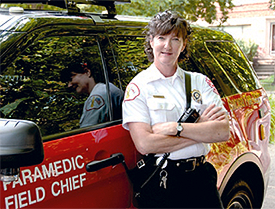 Marjorie Leigh Bomben has been a paramedic with the Chicago Fire Department since 1983, rising through the ranks to become paramedic field chief. She worked on CFD ambulances for twenty-five years.